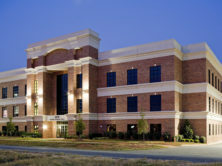 This project consisted of a 45,000-square-foot, three-story Class ‘A’ office building with brick exterior. This building is used for medical and corporate office space. Pennisula Park Executive Building, LLC.